On the night of 27 December 2006 the COROT spacecraft was launched from Kazakstan. It was first proposed by CNES, the French National Space Agency in 1996. The mission is led by the French national space agency. ESA joined the mission by providing the optics for the telescope and testing of the payload. The payload of the COROT satellite consists of a telescope, two cameras - one for each of the two mission objectives (exoplanet search and asteroseismology), and the on-board computer processors. The latter were manufactured in ESA's European Space Research and Technology Centre (ESTEC) at Noordwyk in the Research and Scientific Support Department as one contribution of ESA to the COROT mission. COROT is the first mission capable of detecting rocky planets around nearby stars. It consists of a 30-centimetre space telescope. COROT will use its telescope to monitor closely the changes in a star’s brightness that comes from a planet crossing in front of it. The diagram on the right above is an artist's impression of the Corot Probe observing the transit of the planet across the fae of the star (Illustration: CNES/D. Ducros.) From the ground, the only planets detected around other stars have been giant gaseous worlds (Jupiter-like planets), over 10 times the diameter of the Earth. Not affected by the distorting effects of the atmosphere, COROT will be the first spacecraft capable of finding worlds made of rocks. It will monitor closely the changes in a star’s brightness that comes from a planet crossing in front of it. Although luck may result in the detection of nearby worlds about the mass of the Earth, the mission is designed to detect rocky planets somewhat more massive than the Earth. Such planets will represent a new, as yet undiscovered, class of world called Superearths. On 3 February 2009 the discovery of COROT-7b was announced at the Corot Symposium in Paris. It was discovered by observing its parent star's periodic decrease in brightness due to the planet's transit in front of the star as seen from Earth. Measurment of this dip in brightness, together with a size estimate for the star, allowed the planet's size to be calculated. It is the smallest exoplanet ever discovered to have its diameter measured, at 1.7 times that of the Earth (which would give it a volume 4.9 times Earth's). A very sophisticated instrument-the HARPS Spectrograph- was subsequently used to estimate the mass of the planet. It was found to have a mass of about 4.8 times the mass of the Earth with a density of 5.6 ± 1.3 g cm−3, similar to Earth's. From this, it was concluded that the planet is not composed of pure iron. The likely composition is a predominantly rocky one, similar to Earth's, but with less iron and/or more water, due to the greater compression. It orbits very close to its star (1/23rd the distance of Mercury from the Sun with a 'day' of exactly 20 hours, 29 minutes, and 9.7 seconds). The star is surprisingly distant from the Solar System at about 490 light years and is in the constellation of Monoceras. It is slightly smaller than the our star the Sun. 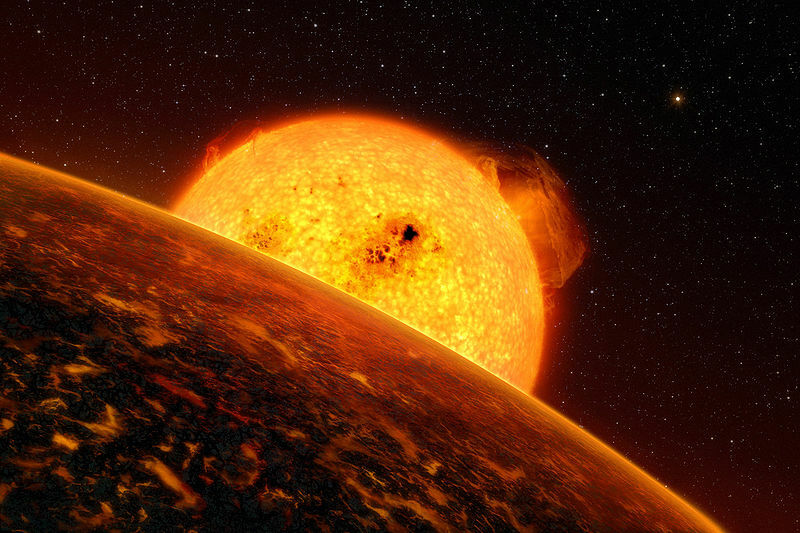 The illustration on the left in above paragraph shows artist's impression of the star as seen from the transiting planet (Credit ESO/L Calcada). The final illustration on the right depicts the dimming of the starlight by the orbiting planet. The dip in the light curve revealed the presence of CoRoT-7b (Credit: A. Leger, ESA).